NASA engineer Bobby Sanders watches as a scale model of the Apollo Command Module is prepared for dynamic stability tests. In this historical photo from the U.S. space agency, preparations for dynamic stability tests of the Apollo Command Module and its launch escape system are observed by NASA engineer Bobby W. Sanders at Lewis Research Center, Cleveland, Ohio, on Oct. 22, 1964. 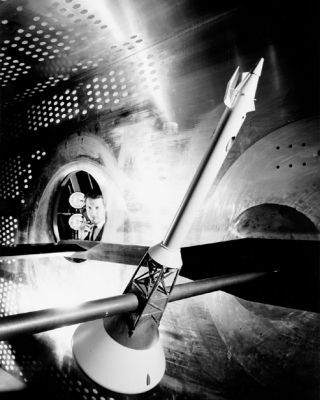 A scale model of the command module in which three astronauts will ride during their journey to the moon, and their launch escape systems are undergoing tests in Lewis' 8 x 6 foot transonic wind tunnel. The tunnel simulates conditions the spacecraft will encounter during a portion of its flight through the Earth's atmosphere.